An independent review to be published on Thursday, January 12th is said to be “broadly positive towards the £1.3bn plan for a pioneering tidal power lagoon in Swansea Bay. Given the government’s support for the hugely expensive Hinkley C nuclear power station, which will require high public subsidy for the costly (compared to fossil fuels) electricity it will produce, and with Mrs May’s determination to promote a positive “open for business” Britain, there is a good chance that the project will receive cabinet approval. This will be a triumph for the renewables industry, as it could unlock a multibillion-pound string of projects harnessing electricity from the rise and fall of the tide around the UK. Together they could provide about a tenth of the UK’s electricity needs and help meet carbon targets. It will be a triumph, too, for Swansea, the city’s second chance to lead the world. 210 years ago Swansea launched the world’s first passenger railway. The Mumbles Railway ran until the early 1960s, when it as summarily shut. Now Swansea could become a world leader in what could become an important branch of renewable energy technology. For me, and I must declare an interest as I was born in Swansea (my travel article here) , this tidal lagoon would be a fine thing quite apart from all the environmental good it should do. It would add a feature of which Swansea could be very proud, destined to last 100 years. It would bring the city recognition around the world, an elegant extension of Swansea’s splendid curving bay, which Victorian writer Walter Savage Landor compared to the Bay of Naples, and to Dylan Thomas’s “ugly, lovely town”. It was in April, 2013, when the consortium behind the project announced a £10m “investment offering” to fund its proposal to build a “tidal lagoon” in Swansea Bay, to produce enough energy to satisfy the domestic requirements of the city. In 2016 ministers ordered a review to see if the technology could affordably provide green energy to the UK. It was widely seen as a way to kill off an ambitious project at Swansea proposed by Tidal Lagoon Power. Former energy minister Charles Hendry was appointed to head the independent study. After “pathfinder” Swansea, five more major plants are proposed, at Cardiff, Newport, Colwyn Bay in north Wales, the Cumbrian coast and Bridgwater Bay in Somerset. The Swansea proposal followed the rejected pinup renewable energy project of the early 2000s, a barrage across the mighty Severn estuary. Second highest tides in the world, providing enough green power to meet 5% of the UK’s energy needs. The idea seemed irresistible. But the UK Parliament’s Energy and Climate Change Select Committee did not agree. In 2013 it said the economic case for the scheme – between a less likely £10bn and a more likely £34bn – had not been made. It recommended proposals for far more modest tidal lagoons be examined first. Tidal lagoons are a new (though not untested) technology, at least in UK waters. 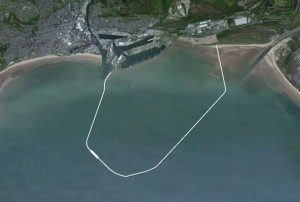 Tidal Lagoon Power’s proposed Swansea lagoon would include a 9.5km sea wall up to 20m high, closing off a tidal sea area of 11.5 sq km. The sea would move in and out of the lagoon area through the wall which would contain a 250 metre long unit housing 16 turbines of 20 MW each, to generate enough electricity for 155,000 homes (equivalent to 90% of Swansea Bay’s annual domestic electricity use) . The lagoon would have an annual output of 320 MW, and would be designed to withstand 120 years of heavy water. In contrast to wind and solar, tidal lagoons would produce totally predictable power 14 hours a day, reducing the cost of stand-by generators. The electricity it would generate is expected to be cheaper than offshore wind and similar in cost to new nuclear. Former Prime Minister David Cameron was enthusiastic about the proposal around the time of the 2015 general election, but his support waned later, and it seemed that the government was looking for a reason to kill the scheme, because of the high cost of the energy it would produce.